This religious tapestry "Madonna Del Libro" or Madonna with Book, is the work of Sandro Botticelli from around 1483. The original is in Milan, in the Poldi Pezzoli Museum. Here we see the Mother Mary educating the young Christ child in a scene which shows a beautiful golden halo around their heads. The halo was used in Renaissance art to symbolise the holy aura that surrounded Mary and Child. Boticelli was a master of the early Italian renaissance and his works are well loved, such as the Primavera, and the Birth of Venus. Here we see his religious works, and his beautiful technique is seen here in this beautiful work. 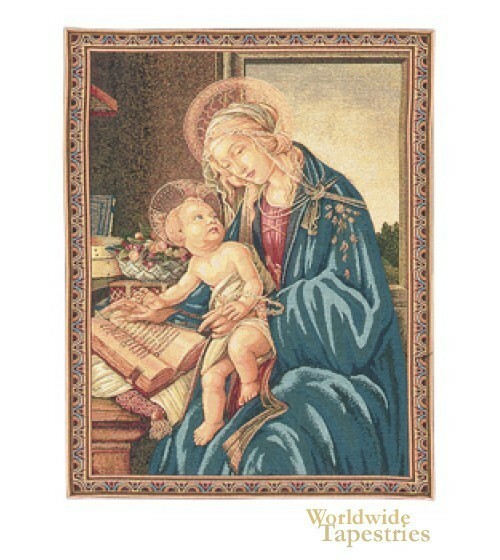 This Christian religious tapestry "Madonna Del Libro" is lined and has a tunnel for easy hanging.